When Oliver returned after falling in a turntable well, S. C. Ruffey and the trucks sang rude songs about the event. Toad, worried by the lack of respect for the engines, consulted with Oliver and Duck and made a plan. Oliver then shunted S. C. Ruffey and his lieutenants, and prepared to pull them. S. C. Ruffey rallied the trucks into holding back, but this only resulted in S. C. Ruffey being pulled apart. The Fat Controller attributed the incident to the wagon's poor condition, but told Oliver not to disclose the fact, saying it was "bad for discipline". After his parts were cleaned up S. C. Ruffey was scrapped. 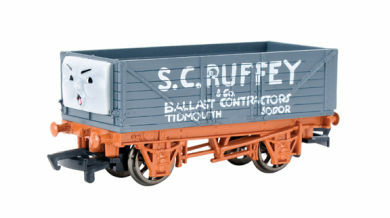 S. C. Ruffey is based on a "Private Owner" 7-plank mineral wagon.